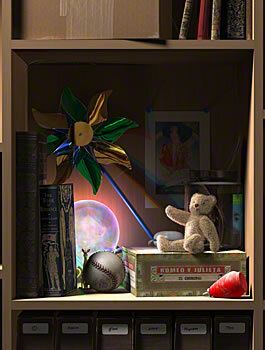 This image was completed in the summer of 2004, and shows a forlorn shelf full of dusty, neglected old toys. Shoved to the back is a ball on a stand, glowing softly with mysterious images; still working, although it's been forgotten. The picture came to me while I was thinking about how children are full of imagination and wonder, but seem to think that they have to "outgrow" all the magic in order to grow up. I find that very sad, and also very unnecessary This picture is here to remind us that we all need to pull out our magic, dust it off, and start to use it again. To remind us that the best adults retain their child-like adaptability, sense of fun, wonder, delight in simple things, and magic. I hope you enjoy it. Made with LightWave 8®, retouched slightly in Photoshop CS®, and using F-Prime from Worley Labs for some of the rendering.